Yes, it's that time of the year when Friday evenings mean a convergence by the railroad tracks across from the library for some live music, local artists, good food and micro-brews. I've said it before that Louisville Street Faire rocks and I am going to say it again! It's grown bigger and more popular - something we really like! 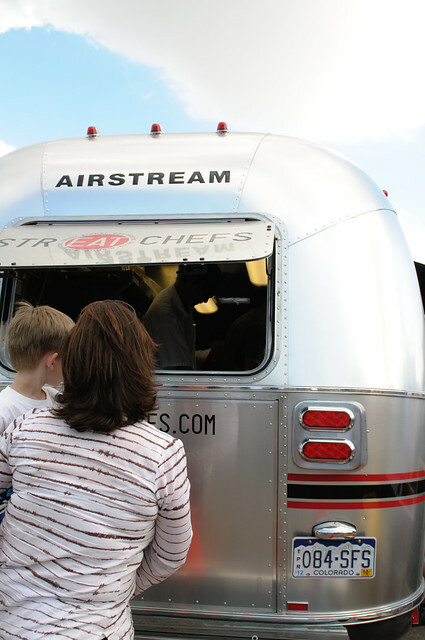 He bought it from the strEAT Chefs at the window of their Airstream trailer. He couldn't stop raving about the fresh flavors. I was very excited to meet Chef Hosea in person! 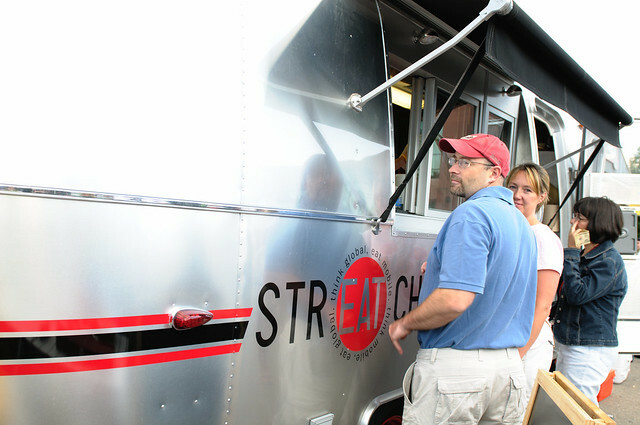 I always knew my friend Paul did good work but you have to see what he and his team did with this Airstream trailer to convert it into a gleaming mobile kitchen for strEAT Chefs! I know I will be going back to try the rest of their menu! strEAT Chefs couldn't have picked a better venue! 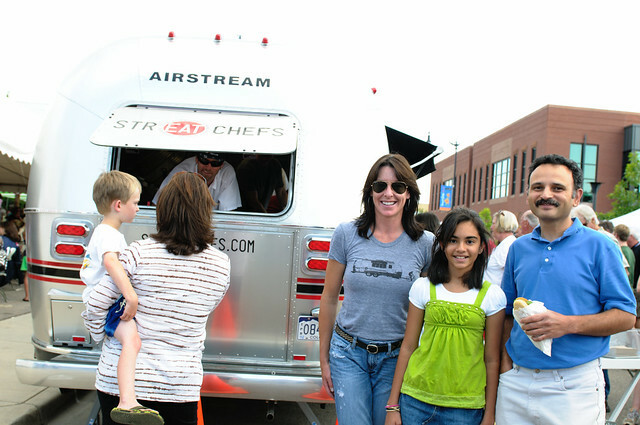 The strEAT Chefs mobile kitchen will be at Louisville Street Faire every Friday through August 13. To keep track of where else they can be found, check out their calendar, follow them on Twitter and bookmark their web site. I am so glad I kept my promise to Medha and took her to the Street Faire! It was my father's 25th anniversary and it made me very sad to realize that he has been gone for more than half my life. I don't stop to wonder what my life might have been like had he not passed away at such a young age because I really know no other nor do I want any different; but I do wonder how our lives would be different today - in the now - if he were here with us. I don't know if that makes sense to anyone else but me. Strangely enough, embracing the sadness gave me the energy to make one of his favorite dishes, kheer. Except, as with everything else, I took a major shortcut because the Street Faire was calling. There was no time to meditate or stir. Wash the basmati rice in several changes of water and drain. Melt the ghee in a small saucepan and add the uncooked rice. Stir the rice for a couple of minutes, then add 1 cup of water. Bring to a boil and when the water level has dropped to below that of the rice, cover and turn the heat to low. Cook for another 5-10 minutes until the rice is completely cooked. In another pot, heat whole milk and half-and-half and simmer, stirring occasionally. Break open the cardamom pods and pry out the seeds. Pound just the seeds in a mortar pestle. Set aside the pods for another use (coming in a later post). Once the rice has cooked, toss it lightly with a fork and add it to the milk mixture. Add agave nectar and cardamom powder. Mix well. Cook on medium heat for about 10-15 minutes, stirring from time to time until the mixture thickens and reduces to a consistency of your liking. Add saffron and serve warm or chilled, as part of the main meal. This is very similar to the western rice pudding except that it has no eggs. 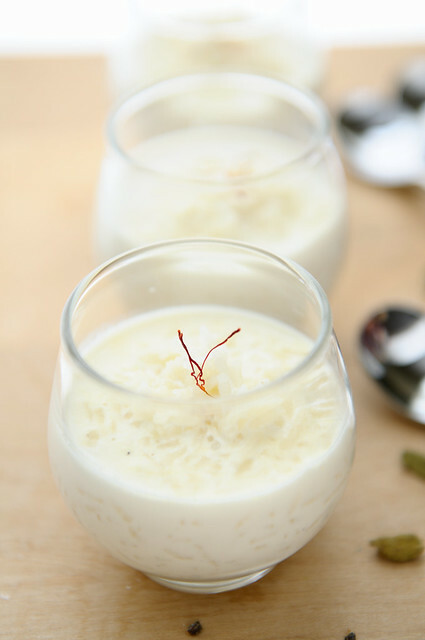 Kheer is made on special occasions and is part of the naivedya or prasad offered to the Gods. By virtue of that, there can be no eggs in this dish. There are versions of rice pudding that have coconut milk but not our kheer, which only has regular milk. Ghee helps the rice cook into long separate grains instead of clumping together. Use butter if you don't have ghee. Typically, our kheer is not very thick and is rather runny. I like to reduce the milk because we prefer it that way. I make this with leftover steamed basmati rice, too. Feel free to adjust the amount of sweetener to your taste. I like to start with 1/8th cup and increase the amount of agave nectar by a tablespoon until I get it right. Or use between 1/4 cup to 1/3 cup sugar instead of agave nectar. I am so sorry to read about your loss Manisha, I am sure he is always watching you..hugs! Medha looks very sweet in green, both of them make a lovely picture..nice to know abt the fair..how nice, Kheer looks very inviting! 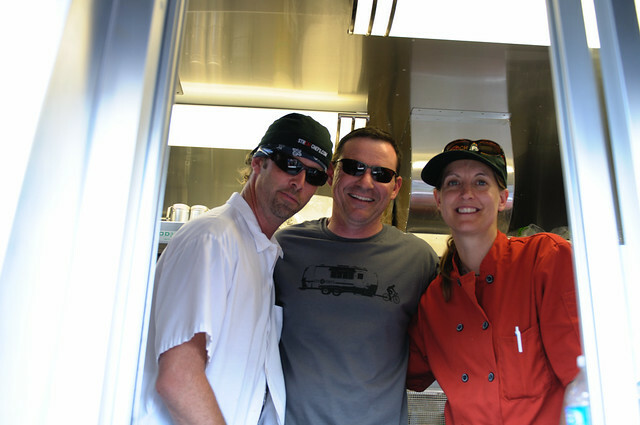 I love fairs like this and the food is always so so good, looks like you all had a great time. My dad passed away whenI was four so I don't temember that much, I have only few memories of them.One memory I have is he taking me to the local streetside shop to buy swweets one day ( pyari sweets) and that he holding one end of hi mundu on his hand. I also don't think about what and if but i sometems also think how different our lives would have been if he was still there. Delicous looking Kheer. Something mom made for all our b'days. The faire looks like so much fun. My dad has been gone for sixteen years now, miss him so much and yes, sometimes, I too think of how life would have been different with him around. And the kheer looks delicious indeed. Manisha, what you said about your dad resonated with me completely. I too wonder how it would have been to have my dad in our lives now - especially as my brother & sil have just had a baby girl. He would have been such a great grandpa. Lovely read, and great pictures. You really 'rock' with a good post against all the odds. Manisha yes I understand you. It gives goose bumps to know how similar thoughts can run in the minds of people who are scattered across the world. My post for my mother is scheduled for her anniversary and I too made something on a whim when I was thinking of her. One of the food memories I associate with my grandad is how he used to cut mangoes and refrigerate them, and skin chilled tadgolas (palm jelly) for us. I don't think I can ever eat tadgola without remembering him. Your words reminded me of something else - that the 13th day (or whichever day) ceremony conducted after a person's death is supposed to include their favourite dishes in the feast - at least I think I heard so. Kheer! Yum. My fav Indian dessert. And MUCH better than American rice pudding. 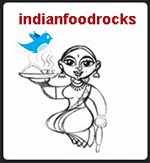 Haven't made it myself, so am happy to see your recipe is simple with ingredients we have in our kitchen. Will give it a try. On missing loved ones ~ these memories linger. Thankfully, the pain softens over time. I have no doubt he would admire your keen intelligence & creativity, be happy you & D. love each other, and adore Medha. 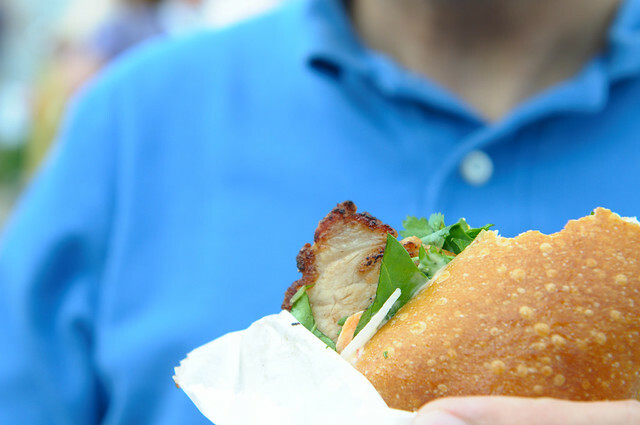 I love street fairs and Food.. The best thing is we can connect to the locals and enjoy the simple and "not so restaurant style but tasty" food.. Am sorry on your loss at the young age... I have the same feeling when I think about my grandpa. Wish he was alive today. I honestly don't know how good this is taste-wise as I haven't tried this one yet but it sure does look appetizing! Your photos are great, it looks yummy! Now I might try making this one and I hope I get the right taste, haha! I would like to share your recipe to other Foodista readers if you don't mind. Just add the foodista widget for whole milk at the end of this post and it's all set, Thanks! I'm deeply sorry about your loss, Manisha. I can feel your emotions and I'm sure he is happy and proud of you wherever he is now! 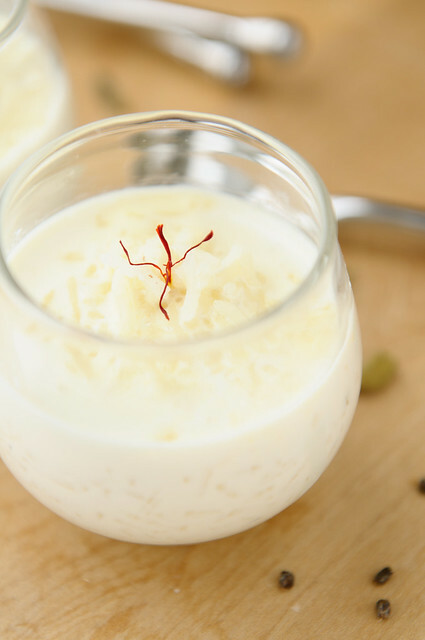 Your kheer looks so delicate and beautiful! I share same method and yeah I like your idea of Agave nectar. You won't believe it but a moment ago I was thinking about any good substitute for sugar in kheer and here I just stumbled here. :) Thanks for sharing your idea for agave nectar. Thank you all for your kind thoughts and understanding how I feel. It's nice to know that I am not the only one. Our fathers would have made for doting grandfathers and our children miss out on that. Valli, the Street Faire is a lot of fun. I am looking forward to going this Friday, too! Happy Cook, hold on to that memory! It is very sweet! Shyam, I knew you would get it! Sanjeeta, thanks! It's good to have you around! Anjali, I just read your post and my heart goes out to you. I know exactly how you feel. Sra, I haven't eaten a tadgola for ages! We had a ceremony on the 12th day. I think some communities have it on the 13th day. Honestly, I don't remember what was prepared as it was very traumatic. I remember cooking vats of stuff for my mother's 12th day and feeding fat Brahmins, after which the leftovers were fed to cows. Anger was the main emotion on that day - at the rituals which made no sense and the 'fear' that they tried to embed in our minds. I would have preferred to give the food to the hungry but no, we had to give it to the cows, who are supposed to eat grass and not human food. I let go a long time ago and it's better that way. Cynthe, it is very simple and this recipe is a shortcut to all the boiling down of milk that is required for a true kheer. Those flavors are richer but we like this a lot, too. RV, yes! 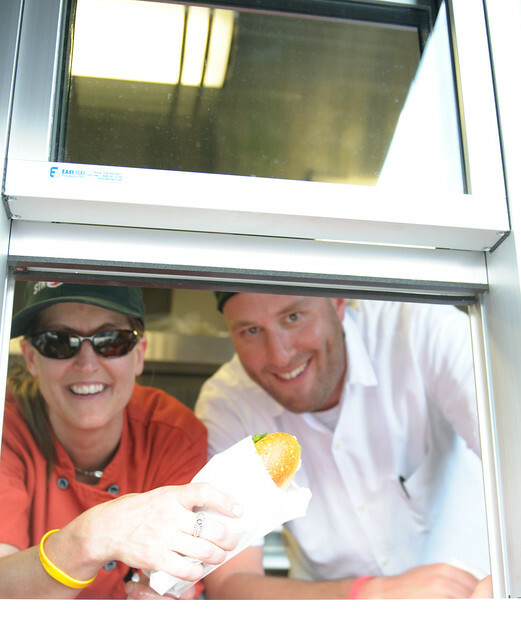 And food trucks like StrEAT Chefs are changing the nature of street food from the same ol' hot dogs and pizza to fresh and flavorful food! smoochkins, let me know if you try it and what you think of it. Feel free to share the recipe but please remember to attribute it to IFR. Thanks! Sonia, so glad you delurked! I've been using agave nectar wherever I can in my daily cooking. I don't use much sugar anyway - not even in our tea or coffee, so this works really well for us. It doesn't interfere with the main flavors of the dish as it does not have a strong flavor of its own - that's the part I like best!